Following the loss of one or several natural teeth, implantology has become a frequent and reliable option to replace them. An implant is a screw of variable size made of titanium. Titanium is an anti allergic material. There is a vast amount of different implants on the market and the dentist or implantologist will have to make a choice. Unfortunately it is not always possible to place an implant. A detailed medical history, X-rays and dental casts are necessary to be able to decide whether an implant is an option. 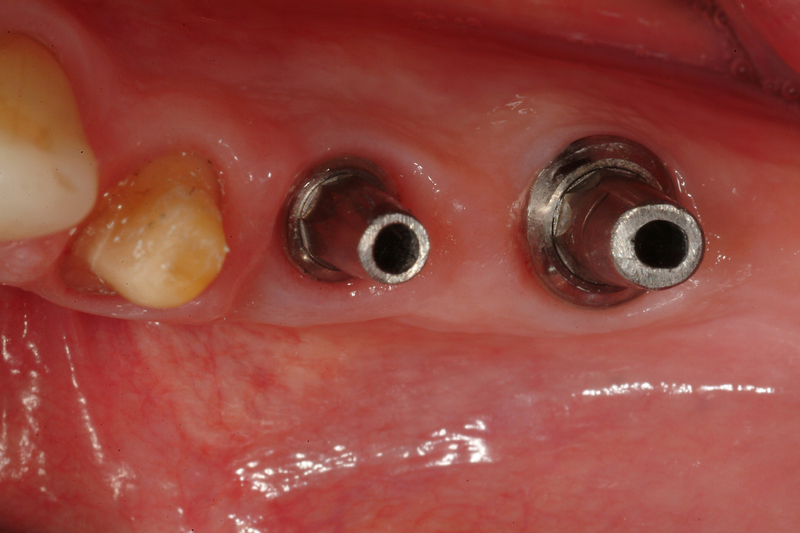 For example, excessive smoking is a relative contra- indication against implant placements. The realisation of an implant is usually done in 2 phases, generally at an interval of 3 to 4 months. 1. Surgical phase: implant placement, often associated with a simultaneous bone enhancement. 2. Prosthetic phase: realisation of a crown or a removable denture. In very rare situations, an implant can be charged immediately and thus avoid a removable temporary prosthesis. In certain complex cases, the treating dentist can refer the surgical intervention to an implantologist. The manufacturing of an implant is very rigorous. The placement is delicate and the optimal result will depend on various factors related to the bone, the gingiva and the prosthesis. The implant success rate is estimated at 85-90 % for 20 years. An excellent daily hygiene and regular visits to the dentist and hygienist are mandatory to assure their durability.